This article discusses the technical examination of five flower and fruit still life paintings by the seventeenth century artist Jan Davidsz. de Heem (1606–1684). The painter is known for his meticulously composed and finely detailed still life paintings and is a master in imitating the surface textures of various fruits, flowers, and objects. Macro X-ray fluorescence (MA-XRF) scanning experiments were supplemented with a study of paint cross-sections and contemporary art technical sources with the aim of reconstructing the complex build-up of the overall lay-in of the composition and individual subjects. MA-XRF provided information on the distribution of key chemical elements present in painting materials and made it possible to recapture evidence of the different phases in the artist’s working methods: from the application of the ground layers, to De Heem’s characteristic oval-shaped underpaintings, and finally, the superposition of multiple paint layers in the working up of the paintings. SEM–EDX analysis of a limited number of paint cross-sections complemented the chemical images with local and layer-specific information on the microscale, providing more accuracy on the layer sequence and enabling the study of elements with a low atomic number for which the non-invasive technique is less sensitive. The results from this technical examination were in addition compared with recipes and paint instructions, to obtain a better understanding of the relation between the general practice and actual painting technique of Jan Davidsz. de Heem. Ultimately, this combined approach uncovered new information on De Heem’s artistic practice and demonstrated the complementarity of the methods. Analytical imaging techniques are of great value for the investigation of old master paintings. Currently, macro X-ray fluorescence (MA-XRF) scanning is one of the most important methods for visualizing the elemental distribution of a painting in a non-invasive way. With separate comprehensive elemental distribution images from the entire paint surface, the technique makes it possible to characterize a painting’s surface and subsurface layers, which may include grounds, underdrawing, underpainting, compositional changes (pentimenti) and even abandoned compositions [1–4]. This offers an insight into a painting’s creation process and the modus operandi of artists. Moreover, since its development, the technique contributed to elucidate art historical, art theoretical and conservation related questions . In spite of its benefits, the technique has limitations as well. The most important drawback of MA-XRF scanning is the fact that the technique is not depth selective, with elemental images that can show contributions from different levels in the stratigraphy . MA-XRF on its own does not reveal the exact number of strata and it is not always clear from which layer the detected signals are stemming. In addition, there is a variable degree of attenuation of the signal, depending on the thickness, atomic number and density of superimposed materials, that has to be taken into account while interpreting the chemical maps. To address this limitation and furthermore to assess the extent to which MA-XRF scanning can characterize a multi-layered painting technique, MA-XRF experiments on five still life paintings of Jan Davidsz. de Heem (1606–1684) were complemented with cross-section examinations and technical historical sources. Jan Davidsz de Heem is known for his elaborate finely detailed and meticulously composed still life paintings and considered as ‘one of the most notorious flower- and fruit painters’ . The case studies are five flower and fruit still life paintings, dated in De Heem’s middle-late period between the 1650s and 1684, with similar subject matters, from the collection of the Rijksmuseum, the Mauritshuis and the Royal Museum of Fine Arts in Antwerp. As illustrated in Fig. 1, the case studies include four paintings on canvas and one smaller painting on a copperplate. While Meijer recently published a monography on De Heem’s oeuvre, technical aspects of his work were published by Wallert . A limited number of existing paint samples from the museums’ collections were re-examined. Cross-section microscopy has proven to be highly complementary with MA-XRF, combining the overall compositional information of a painting with local, but layer specific analysis of a paint system on the microscale . Subsequent analysis of the paint cross-sections by means of a scanning electron microscope equipped with an energy dispersive X-ray (SEM–EDX) spectrometer provides more information about how chemical elements are distributed over the various layers and enables a better detection for lower Z elements, for which MA-XRF is less sensitive . Finally, a multi-disciplinary approach was employed by comparing the results from MA-XRF scanning and cross-section analysis with advised recipes, as well as materials and techniques written in seventeenth century artist’s manuscripts. The study of seventeenth century flower and fruit still life paintings is ideal for this type of research for several reasons. The practice was determined by common stylistic rules, techniques, and recipes . A specific multi-layered build-up for each subject is in fact characteristic of this genre, where the technical challenge for painters was to achieve and imitate the perfect surface textures and the accurate appearance of objects such as the soft and delicate petals of pink roses, the velvet skin of plums, peaches and apricots, dewdrops on Spanish grapes, or the reflected glow on golden goblets. An elaborate working process that required a precise touch, a systematic approach, and the use of proper painterly effects from the ground up to the uppermost paint layers for each depicted object. Fortunately, the seventeenth century instilled a great enthusiasm for publications on technical matters, including the materials and techniques for still life painting. Various technical sources contain recipes for the preparation of paints, with characteristics, their compatibility with other pigments, their working qualities, their ageing properties, and techniques for refining [10, 11]. Other technical sources comment on the proper way to arrange the composition, sometimes giving detailed descriptions on how to paint specific types of objects [10, 12]. This provides a wide range of information for technical examination of relevant works. For organizational reasons, two different instruments were used. 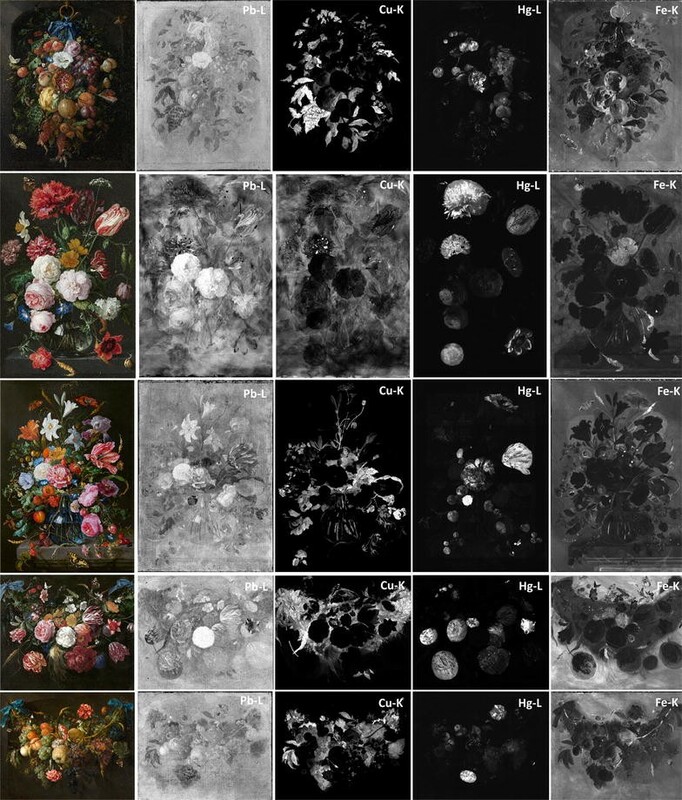 Elemental mapping of the entire surface and details of the paintings from the collection of the Rijksmuseum, Still Life with Flowers in a Glass Vase and Festoon of Fruit and Flowers were performed with the commercially available MA-XRF scanner M6 Jetstream from Bruker Nano GmbH (Berlin, Germany). The M6 Jetstream consists of a 30 W Rh-target microfocus X-ray tube with a maximum voltage of 50 kV, a maximum current of 0.6 mA, a polycapillary lens, and a 30 mm2 X-Flash silicon drift detector that is moved over the surface of the painting by means of an X, Y-motorized stage, enabling a scan area of 80 × 60 cm2 . A spot size of 150 µm was set for the measurements. The elemental distribution maps of the painting Festoon of Fruit and Flowers were collected with a step size of 600 μm and dwell time of 50 ms/step, covering the complete surface (1232 × 963 pixels), and a step size of 400 μm and 250 ms/step for a detailed area (478 × 552 pixels). The full surface of the painting Still Life with Flowers in a Glass Vase (1072 × 704 pixels) was scanned with a step size of 500 μm and a dwell time of 100 ms/step. In addition, two detailed scans were made, one in the center of the painting (532 × 498 pixels), scanned with step size 500 µm and dwell time 200 ms/step; and one of a detail of the yellow Persian roses (275 × 283 pixels) with step size 300 µm and dwell time 200 ms/step. The still-life paintings Garland of Fruit and Flowers and Vase of Flowers from the Mauritshuis museum and Flowers and Insects from the Royal Museum of Fine Arts Antwerp were measured by means of the AXIL scanner, an in-house built mobile MA-XRF scanner (AXES, University of Antwerp, Belgium). The AXIL scanner consists of a 50 W Molybdenum anode microfocus X-ray tube (XOS X-beam powerflux) equipped with a fixed polycapillary lens and a Silicon Drift Diode (SDD) detector, mounted on a motorized stage. This scanner allows for the investigation of an area of 60 × 57 cm2 in a single scan. The X-ray source was operated at 50 kV voltage and 1 mA current, collecting full surface maps with step size 650 µm and dwell time 285 ms/step for Garland of Fruit and Flowers and Flowers and Insects and step size 600 µm and dwell time 275 ms/step for Vase of Flowers. All XRF spectral fitting were processed using the data analysis software packages PyMca (Python multichannel analyzer) and Datamuncher Beta 1.2.2 [14, 15]. The available paint cross-sections were re-examined and photographed according to the protocol of the Paint Sample Database (PSD) in the atelier building of the Rijksmuseum. For imaging the paint cross-sections in visible light, Bright Field (BF) and Dark Field (DF) mode, and Ultraviolet radiation (UV365 nm), the light microscope Zeiss AXIO Imager.A2m (Carl Zeiss Microscopy, LLC, United States) was used. Images were recorded with an Axio Cam MRc5 mounted camera, producing 5 megapixels 12-bit images. White light was provided by a LED lamp with a color temperature of 5600 Kelvin and a colibri.2 controller for UV-fluorescence microscopy (LED 365 nm). All images were obtained and processed in the image-acquisition software Zen 2 pro (blue edition) with extended depth of focus (MEDF) facilities and observed on a calibrated Eizo Color Edge CG277 BK computer screen. All microscopic images were color calibrated with the Rijksmuseum CZI conversion utility tool, created by Robert Erdmann. Scanning electron microscopy in combination with energy dispersive X-ray analysis (SEM–EDX) studies were performed on a JEOL JSM 5910 LV scanning electron microscope with Noran Vantage EDX system (spot analysis and elemental mapping facilities) at the Cultural Heritage Agency (RCE) in Amsterdam. For the analysis of high-resolution SE and BSE images in high vacuum, samples were gold-coated in a JEOL JFC 1200 fine coater prior to analysis to improve surface conductivity. EDX spot analysis of the pigment particles was done at 20 kV acceleration voltage, 5–10 mm eucentric working distance in high vacuum. The significance of the analyses was substantiated with three historical technical sources on the oil painting of still lifes. In this framework, the most relevant source with detailed instructions for the pictorial construction of objects with different surface textures is the painter’s handbook ‘De groote waereld in t kleen geschildert’, i.e. ‘The big world…’ (1692), published in Amsterdam by Willem Beurs . A second manual, ‘Het Groot schilderboeck’, i.e. Great book of painting (1707) by Gerard de Lairesse, provided key information on the arrangement and composition . Finally, the manuscript Secrets in the Noble Arts of Miniatura or Limning, by minor artist Daniel King (1653–1657) contains important original information on oil painting techniques and technical instructions, including recipes from Jan Davidsz de Heem, referred to as ‘Mr. deHeem’ . This book is, in fact, an appended copy of the work of Edward Norgate’s Miniatura or the Art of Limning, from ca. 1646 . De Heem’s painting technique is discussed in this section based on examination of the five still lifes under the optical microscope, elemental distribution maps and paint cross-sections linked with technical sources. First, the overall build-up of the paintings is discussed, followed by an in-depth study of the layer system of three details from two paintings: the foliage, a tulip, and an orange, three themes that are considered to be illustrative for De Heem’s refined painting practice. The layered structure encountered in the five still lifes demonstrates a number of similarities as will be discussed in the next paragraph. This systematic approach can even be noticed in the priming of the canvas paintings. However, characterizing ground layers with MA-XRF scanning is challenging as the emitted fluorescence signal from priming materials is usually significantly attenuated by the superimposed layers. As illustrated in Fig. 2, the Pb–L maps of all five canvas paintings show a relatively uniform lead distribution over the entire surface, with the depicted subjects in negative. The latter indicates that the detected lead signal is mostly stemming from below these subjects as the fluorescence is (partly) absorbed by their superimposed paint layers. Moreover, the fact that the structure of the canvas weave is visible in the Pb–L map suggests that this uniform lead white-based layer is filling the interstices of the canvas and thus in direct contact with, or at least close to, the canvas (see Fig. 4, Pb–L map). When looking closely at the borders of the painting, it becomes clear that the ground contains iron (Fe–K), calcium (Ca–K) and manganese (Mn–K) as well, as the detected signals are stronger in areas where the paint is abraded due to handling or friction with the frame. These damages provide direct access to the preparation as the emitted signals are not attenuated by the overlying paint, as illustrated by Fig. 3. This hypothesis was confirmed by means of microscopic examinations of paint samples. The cross-sections supplied additional information establishing that the works on canvas were all prepared with a double ground. The first is a thin reddish brown ground composed of mainly fine-grained earth pigments, a few particles of umber and chalk, as demonstrated by EDX spot analysis. A thicker grayish brown layer follows, containing a mixture of primarily lead white with fewer particles of umber, red earth pigments and chalk. The painting on copper is somewhat deviant as the cross-section presents a single preparation layer with mainly lead white, charcoal black and earth pigments. This support requires a different handling as compared to the preparation of canvas, but the identified materials conform to recipes described in art technical sources [18, 19]. The different ground is clearly reflected in the MA-XRF Pb–L map shown in Fig. 2, as well as the uniform copper distribution over the entire surface, stemming from the copper substrate. On top of the aforementioned double ground, De Heem first indicated the position of the most prominent fruits, flowers and foliage with an underpainting, also referred to in the literature as lay-in [20, 21] or dead-coloring/doodverf . The underpainting is a key phase in the creation process of a painting defining place and harmony in relation to the surrounding objects. XRF mapping exposes this initial phase, now covered by superimposed paint layers and reveals a carefully planned arrangement. As illustrated by Fig. 2, MA-XRF scans expose abstract, oval-shaped underpaintings for flowers. These underlying layers are visible in Fig. 2 in the Hg-map for the red flowers, in the Fe-map for yellow flowers and in the Pb-map for the white flowers. These egg-shaped forms were applied bigger than the final result, and were narrowed down in a later stage (see further). The underpainting for the fruits is less pronounced than the flowers, as De Heem already follows the shape of the fruit better in this initial phase. Interestingly, De Heem always marked the red flowers in the foreground, with a vermilion underpainting, a red lake was used for the background flowers and a mixture of both for the flowers in between. In this way, the color of the underpainting, that most of the time contributes to the final appearance, determines the object’s distance in space. Strong and bright colored flowers tend to catch the eye, bringing the object to the foreground, while darker colors push the object to the background. In the case of the two garland paintings, De Heem also defined the shape of the guirlande before applying the characteristic big oval shapes for the flowers, as illustrated by the corresponding Cu-map in Fig. 2. A similar build-up is described by the Dutch golden age painter and art theorist Gerard de Lairesse: ‘To paint a festoon, one shall first assign its course and determine how thick or thin it has to be: subsequently the greenery is added, painting the leaves and the foliage, rendering the day side and the shadows according to the light. When dry, one shall arrange the flowers, beginning with the most important, each on their assigned position, and laid-in with a single color, red, blue or yellow, with such a hue that it is proficient to render the day side and shadows from life or from models.’ . For the other three paintings, the underpainting closely follows the outlines of the final greenery and was applied after the position of the most prominent fruits and flowers were indicated. Cross-section and microscopic examinations substantiate these findings. Subsequently, De Heem proceeded from this preliminary composition and worked up the individual depicted flowers, fruits, and other objects in a complicated stratigraphy of paint layers and glazes conforming to the appropriate lighting conditions, ultimately obtaining a balanced depiction of light and shadow. Here, De Heem made use of a systematic approach where each fruit or flower is painted with a specific and identical layer build-up and pigment choice. This was observed by studying the build-up of reoccurring fruits and flowers in the five still life paintings. The main signals observed for the foliage are Cu (copper based green/blue pigment), Ca (yellow lake substrate) and Pb, Sn (lead–tin yellow) for the garland paintings and an addition of Ni, Co, K signals, elements associated with smalt, a blue cobalt potash glass pigment , for the other paintings (see Additional file 1). Examinations under the stereomicroscope learn that the dark background paint mostly overlaps the outlines of subjects. This finding establishes that the background was applied in the final stage of the painting process, around the main composition. To finish the painting, smaller fruits, little insects and wheat stalks were then painted on the dark background. In the next few paragraphs, we discuss the build-up of these compositional elements in more detail. A remarkable aspect of the flower and fruit paintings of Jan Davidsz. de Heem is the beautifully preserved powerful green of the foliage. For seventeenth century still life paintings this is not obvious, as green tones were subject to discoloration. Especially the use of fugitive yellow lake pigments such as Pinke, known in Dutch literature as Schietgeel, in mixtures with blue pigments was responsible for the discoloration of green hues in many paintings . King’s manuscript includes a recipe from Jan Davidsz. de Heem for painting shadows on the foliage and darker leaves. He recommends to paint them with terra verde [referring to green verditer, not to be confused with green earth or terre verte , smalt, and sometimes to also incorporate brown and red pigments . Figure 4d presents the high-resolution chemical maps recorded on a foliage detail of Festoon of Fruits and Flowers. The overall foliage of the festoon and shape of the leaves is defined in the chemical maps for Cu, Ca, Co, Ni, K, Sn, Fe and Pb. Copper is richly present in the green areas of the foliage. A previous study on the cross-section of the painting by Wallert revealed the use of an artificially precipitated copper pigment, which was interpreted at the time as green verditer based on its spherical particle shape and color, mixed with the blue pigment smalt and a yellow lake . However, the color of verditer should be interpreted carefully as a later study by van Loon points out the difficulty in distinguishing the exact color of blue and green verditer under the light microscope . The brown/yellow matrix in which the particles are embedded can obscure the perception, and in addition the particles can vary in color due to the manufacturing process . 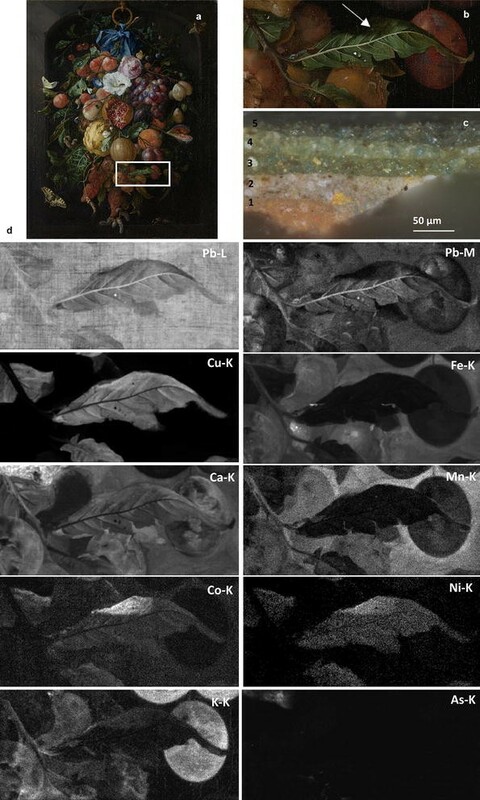 Interestingly, subsequent MA-XRPD scanning experiments performed directly on the painting (results will be published separately) visualized the distribution of azurite throughout the leaf area. This finding can point towards the use of either natural occurring azurite or its synthetic equivalent ‘blue verditer’ as both copper carbonates (2CuCO3Cu(OH)2) possess a similar crystal structure. Blue verditer can only be distinguished from azurite by its spherical particle shape. So the copper pigment is likely blue verditer, and not green verditer (which has the same chemical composition as malachite) . The calcium distribution map closely correlates with the copper map in the foliage areas. Chemical maps for calcium are often difficult to interpret because the element is present in various painting materials, like chalk, gypsum, bone white or bone black. The presence of calcium detected in the foliage may be a residue of chalk that was used in excess during the manufacturing process of the copper pigment green verditer [27, 28]. However, the signal of Ca is also abundant in richly dark yellow glazed shadows, and therefore it is more likely present as a substrate of a yellow lake, mixed with the blue verditer. Norgate acknowledges its value in mixtures when he suggests that with ‘pink [and]… verditer you are to make the fairest greenes,..’ . A note on shadowing is found in a recipe of ‘Mr. deHeem’ in King’s manuscript for shadowing objects. De Heem advises not to use umber or black pigments in the shadows of fruits and flowers, but instead to use yellow and red lakes . The cobalt and nickel maps are found to be correlated, indicating the presence of smalt . Nickel is associated with the cobalt ore. Historical descriptions of the production of smalt mention that the cobalt ore was roasted for purification in order to remove contaminants such as arsenic . For pigment production, this step could be intentionally skipped, using the arsenic as an opacifier, making the smalt particles less transparent and the colour more intense [24, 30]. However, the As-map of the painting demonstrates the presence of this element only in the citron and orange where orpiment and/or realgar were used and not in the cobalt areas in the foliage. Presumably, De Heem deliberately used roasted ore with a higher transparency to take advantage of the glazing properties of smalt. The function of the smalt is here not to create a bluer shade but to darken the tone in this shadow area of the leaf. This confirmed a theory already suggested by Wallert for another painting of De Heem . As shown in Fig. 4c, a sample was extracted from this shaded part of a leaf. Apart from evidencing the observations from the MA-XRF scans, the cross-section revealed a build-up of five layers, indicated with numbers 1-5 in Fig. 4c. The first two layers (Fig. 4c 1–2) comprise the double ground discussed in the previous section. A green colored underpainting is visible as layer 3 containing blue verditer, yellow lake and smalt. A lighter green was superimposed for modelling texture and veins with lead white, blue verditer and yellow lake (layer 4). The final dark paint layer (layer 5 in Fig. 4c) is the shadow on the leaf and contains blue verditer, smalt and red lake. One of the studied paintings is a garland, Flowers and Insects, from the collection of the Royal Museum of Fine Arts in Antwerp. The still life is a well-preserved oil painting on canvas and dated between 1660 and 1670. Characteristic of this period is the depiction of iris and tulip species that are painted half open with slightly twisted petals . Conform to all paintings in this study is De Heem’s abstract, oval, or even egg-shaped underpaintings to paint flowers. In Fig. 5, a selected number of XRF distribution maps are shown to demonstrate the build-up of the prominent white and purple striped tulip in the lower right corner. The maps for Pb, Ca, Fe, Mn, Hg, K and Sn are details taken from a larger scan. As for all canvas paintings under study, lead is present as a constituent of the second ground layer, with the Pb–L signal reproducing the weave pattern of the canvas. However, in the region of the tulip, the Pb-map also shows a clear round-shaped underpainting that clearly exceeds the final outlines of the flower. This shape is present as a negative image in the Fe, Mn and Ca maps as well, because it was applied on top of the double ground. As such, the oval underpainting shields the signals of the elements in the ground layers. A cross-section, taken from a white stripe of one of the purple petals, confirms the presence of an underpainting on top of the double ground composed of lead white, red lake, and some vibrant red particles, most likely vermilion (Fig. 5b, c, layer 3). The subsequent layers also contain tin (Sn-map) and red lake, which has a pink fluorescence under UV . Lake pigments were an essential constituent of De Heem’s palette to give depth and transparency for shadowing. Red and yellow lakes are translucent pigments, prepared by the precipitation or adsorption of an organic dyestuff onto an insoluble substrate . The organic dyestuff of the red lake cannot be detected by means of MA-XRF scanning. However, in this case, its distribution is visualized by the potassium image in Fig. 5 that corresponds to the deep red and transparent glazes (Fig. 5b, c, layer 4–5) for rendering the shadows and to model the tulip. 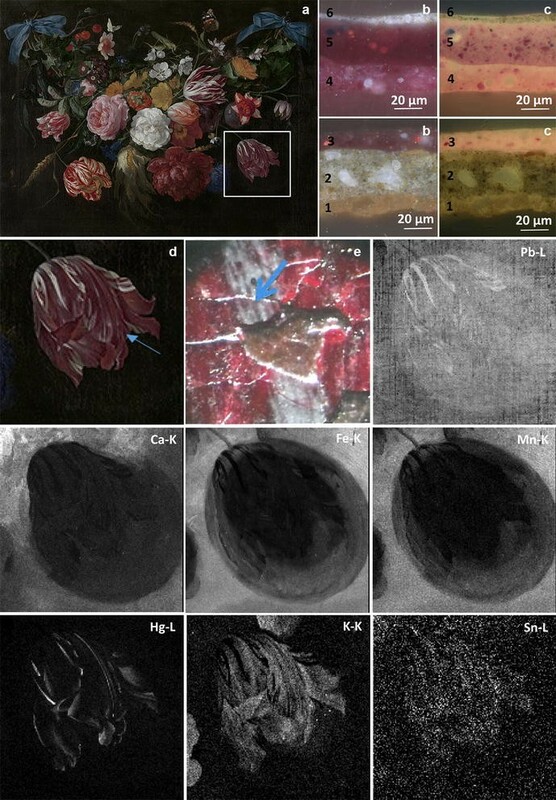 As already previously observed in a technical study of Rembrandt’s Self-portrait with MA-XRF scanning, the potassium distribution image appears to be a good marker for lake pigments . The potassium signal probably stems from an inorganic potassium substrate on which the dyestuff was precipitated to obtain a granular pigment. Alum, a potassium aluminum sulfate (AlK(SO4)2.12H2O), was commonly used for the production of red lake pigments . The alkali for this reaction was commonly lye prepared from wood ash, but could also originate from calcium-rich substrates such as chalk, marble dust, egg shells, or cuttlefish bone . For all studied artworks, calcium and potassium fluorescence was detected in the rich yellow and deep red to purple glazed shadows of fruits, foliage and flowers. Lakes are suitable to obtain richly colored transparent glazes because the substrate itself is transparent in an oil medium . De Heem thus indicated the lay in of the tulip with a layer of red lake, lead white and a small amount of vermilion red (HgS). This toned layer served as a basis for rendering the whitish stripes on top of the purplish glazes for the shadows, while the reddish vermilion and red lake paint defines the petals of the tulip in the reflection of the light. To obtain a purpler glaze, De Heem added a blue pigment in the mixture, identified as small particles of ultramarine (Na8–10Al6Si6O24S2–4) in the transparent red glaze (Fig. 5b, c, layer 5). It is likely that De Heem used this high-quality blue pigment for all blue regions in the studied paintings. It was found in a mixture to paint the dew on grapes and plums, also referred to as ‘mealie colour’ in historical literature [16,] or highlights. The white lines of the white and purplish striped tulip were applied with lead white and some black particles (Fig. 5b, c, layer 6). The constituting elements of ultramarine, a complex sulfur-containing sodium-silicate, are difficult to detect by in situ MA-XRF scanning as the emitted low-energy fluorescence are easily absorbed by ambient air or superimposed paint and varnish layers. However, the presence of ultramarine can often be visualized in rich blue areas through the distribution of potassium, an impurity from the lapis lazuli stone that was left from the production process. To obtain purified ultramarine, the ground lapis lazuli is mixed with wax and kneaded in a dilute lye solution of potassium carbonate . However, potassium can be found in other painting materials, such as the substrate of lakes, smalt or earth pigments, which complicates interpretation. Sometimes, its source can be deduced based on color, but in this case, a cross-section was available to ascertain ultramarine particles in the red lake glaze. A previous study by Wallert demonstrated a neatly match between the build-up of the orange in the painting Festoon of Fruit and Flowers and painting instructions of Willem Beurs: “Next to pomegranates it is best to place oranges, which can be found appropriately tempered on the day with vermilion, realgar, and dark yellow lake. When this is dry, they are glazed in the reflection with dark yellow lake, a bit of red lake, and in the shadows with red lake and a mixture of yellow lake with a tiny amount of black. On the day, highlights are made with just realgar, and if they are paler yellow, it is mixed with orpiment to make highlights.” [10, 37]. The sequence of paint layers of that cross-section, taken from the day side of the orange, shows a layer of vermilion, yellow lake, lead white and earth pigments on the double ground, followed by a thin layer of lead white, silicon particles and earth pigments. This was covered by a thicker paint mixture of realgar and orpiment and a highlight of orpiment with gypsum. The chemical images of iron and mercury demonstrate a layer for the whole surface of the orange but are individually attenuated differently by the superimposed orpiment layer (As–K). On the shadow side of the orange, the iron and mercury signal is, therefore, more abundant, since De Heem only applied the arsenic containing paint layers on the illuminated side. The deeper shadows on the fruit are visible in the element distribution images for calcium and potassium, possibly indicating the presence of yellow and red glazes as suggested by Beurs (Fig. 6). Although MA-XRF scanning is not depth-selective, it appeared to be highly suitable to study the complex layer sequencing that is typical for seventeenth century still life paintings. The ground rule was to start off with an underpainting, blocking out each figure in its own basic color, using pigments with strong hiding power and/or tinting strength and then gradually building up the tonality and form by applying local passages of transparent pigments in the upper paint layers. This particular system, in fact, favored characterizing the build-up of the paint layers with MA-XRF scanning. Pigments with more body, such as vermilion (HgS), lead white (PbCO3·Pb(OH)2) and umber (Fe2O3·(H2O) + MnO2) were often found in the ground, underpainting, or as small highlights in the upper layers. Those pigments are composed of elements with a high atomic number, and are consequently easier to detect with MA-XRF scanning and less influenced by attenuation. In addition, the superimposed layers are projected as a shadow on top of the fluorescence emission from subjacent layers. Therefore, the degree of attenuation and blocked fluorescence emission of the elements gave an insight in the layered sequence. In return, pigments with a smaller body and little hiding power, such as ultramarine and lakes, are composed of elements with a low atomic number and are highly influenced by attenuation and blocking by other elements. Since they are usually found in upper layers of the strata, the fluorescence emission of the elements is either not or to a lesser degree attenuated. Moreover, color information from the paint surface can ameliorate the ability to distinguish pigments with the same element composition. 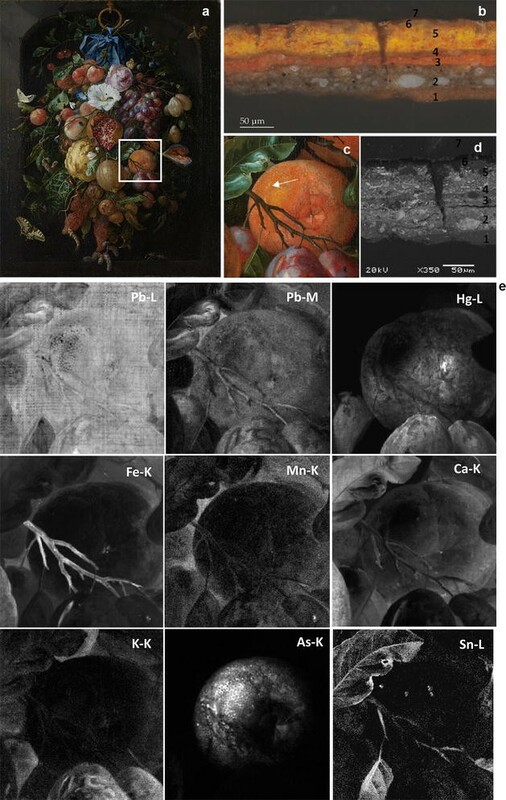 In this paper, a combination of MA-XRF scanning, microscopic cross-section analysis and art technical sources has been used to study the multi-layered painting technique of five seventeenth century flower and fruit still lifes from Jan Davidsz. de Heem. MA-XRF scanning proved to be significantly useful in the study of still life paintings. By presenting compositional information from the entire painted surface in a visual manner, the element distribution images could comprehend a large part of methods and materials used by De Heem, reveal changes in the painting process, visualize the condition of the art works and conservation treatments, and gain profound insights into how the paintings were constructed. With MA-XRF scanning, it was possible to recapture unique evidence of working methods: from the application of the ground layers to the characteristic shaped underpaintings, and finally, to the addition of multiple paint layers in the working up of the paintings. This revealed De Heem’s systematic approach on how to achieve the perfect texture and luminescence for every subject. The chemical scans provided a view into the characteristic underpaintings, which he applied in an even color (usually lead white, vermilion or ochre) to mark the position of the main subjects in the composition. This is of importance since for this aspect in 17th century paintings, cross-section analysis, XRR and IRR are often of limited use. In X-rays, some of the undermodelling paint layers are visualized. With cross-sectional analysis, the composition of the underpainting can be identified. However, MA-XRF scanning goes beyond that by characterizing the locally applied shapes to specific elements. With this improved reading of multiple layers and stages of painting, also the interrelationship of the flower still life paintings become more obvious. In addition, microscopic cross-section analysis provided complimentary information to the elemental maps. It allowed the identification of pigments, especially those with the same element composition and offered depth selective information on the individual layers in the paintings. Examinations with SEM–EDX allowed the detection of low Z elements to which MA-XRF is insensitive. In the end, the results obtained with scientific examination were compared with technical instructions and recipes from contemporary art historical technical sources. In this manner, De Heem’s actual painting technique could be matched with recipes and suggestions described in the manuscript of Willem Beurs, het Groot schilderboeck of Gerard de Lairesse, as well as with notes and recipes from the painter himself in the manuscript of Daniel King Secrets in the Noble Arts of Miniature or Limning. Ultimately, this interdisciplinary approach uncovered new information on De Heem’s artistic practice and demonstrated as well how the techniques complement each other. NDK wrote the manuscript which was revised by GVdS, AL and KJ. NDK, AL, AW, GVdS and SL made substantial contributions to acquisition of data, or analysis and interpretation of data. All authors read and approved the final manuscript. This work is an extension of the Master thesis in Conservation-restoration (University of Antwerp, 2015–2016) of Nouchka De Keyser. Thesis supervisors were Dr. Geert Van der Snickt (Cultural heritage scientist, AXES, UA) and Dr. Olivier Schalm (Research scientist, UA). This research was supported by the Baillet Latour fund. The authors gratefully acknowledge the involved institutes (Rijksmuseum, the Mauritshuis and KMSKA) for the opportunity to examine the still life paintings of Jan Davidsz. de Heem. A great thanks is therefore due to Petria Noble, Pieter Roelofs, Anna Krekeler, Susan Smelt, Robert Erdmann, Abbie Vandivere, Edwin Buijsen and Masayuki Hinoue. SEM–EDX measurements were performed by Katrien Keune, scientific researcher at the Rijksmuseum. 40494_2017_151_MOESM1_ESM.docx Additional file 1. Additional figures.